Here we go again: following on from my last blog regarding 3D anamorphic pavement art. Here’s another clipping from my favourite newspaper THE DAILY STAR. Yep….and yet again the photographer gets it wrong. The thing about 3D street art is that if you photograph it from the wrong point of view the 3D illusion is blown. Anamorphic art is only meant to be viewed/photographed from ONE point; from every other point of view the image looks wrong and twisted. I first became aware of 3D pavement art in 1998, when a promoter sent me a photo of a work by Julian Beever and asked me if we could do something similar. My first impression was that the photo had been ‘photoshopped.’ Initially, I couldn’t work out from the photo, exactly how it was done. 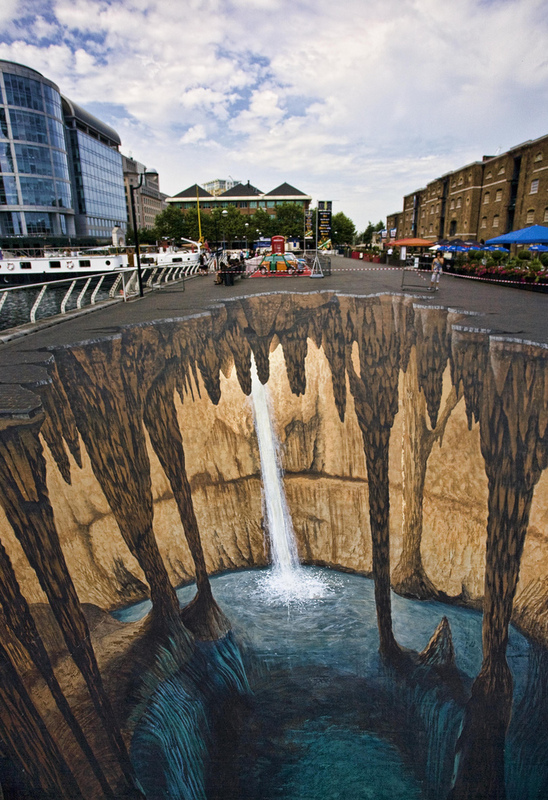 It beggared belief, and that is the attraction of 3D pavement art. If viewed from the correct angle, it’s sometimes difficult to believe that somebody, other than a computer has created it. If course it’s no coincidence that Julian Beever and others started creating 3D pavement art around 1997. It had never existed before this date for one simple reason – THE INTERNET! This was a pavement art made to be photographed and sent across the ether. Without the internet, there would be no 3D pavement art. 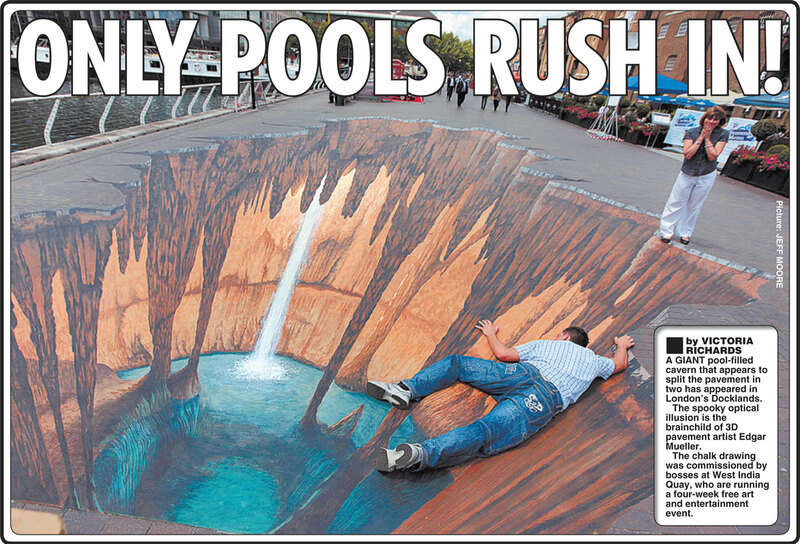 The World Wide Web has made superstars out of 3D pavement artists like Julian Beever, Edgar Müller and Kurt Wenner. It’s important to say that 3D anamorphic art was NEVER ”invented’ by any of these artists. It’s a technique thats been used by artists for well over 500 years. I’ll be explaining exactly how 3D pavement art works in a future blog, but just to say that, like the work itself, all may not be as it seems. Let me dispel some myths; take this work by German artist Edgar Müller for instance. In the newspaper cutting it mentions that this is a “chalk drawing” and it would be fair to assume that this was done directly onto the pavement, but you would be wrong. If it were a chalk drawing, then the poor chap lying on the art would be covered from head to toe in chalk dust. This is in fact a painting made using water-based acrylic paints. It’s painted on a black plastic membrane that has been cut to shape and stuck onto the pavement. Now, I’m a big fan of Müller’s work, he’s even one of my Facebook friends, but……. I have seen artists use this technique and then come along and ‘pretend’ to be chalking it in…no kiddin’ People rarely question how things are done, and can be easily duped. These works usually take between four and five days to complete…..I have even seen artists produce these in large warehouses, and then roll out the completed works on the street…..Street art, INSTANTLY YOURS! Most pavement artists jumping on the 3D bandwagon today, use some kind of computer program to do all the hard work for them, such as working out the angles etc. The work is then transfered to the pavement using the traditional ‘squaring off’ method. SIMPLES! It’s about as far removed as you can possibly get from the traditional ‘screeving’ performance chalking pavement art that it is pretending to be. I have no objection to this type of art and wouldn’t dare question the technical abilities of the artists concerned; I just wish it would be more honest and truthful. It’s also true that not all 3D pavement art is produced this way and many artists have honest intent, but those who don’t make me go GRRRRR! I’ve spent my entire career knocking down barriers in art, only to see others, trying to rebuild the walls. Art should always be honest & truthful, or not at all. Visit All My Own Work – My history of Pavement Art blog! 22 Mar	This entry was published on March 22, 2012 at 8:44 pm. It’s filed under arts, culture, street art and tagged 2009, anamorphic, art, artist, artists, arts, battle, canvas, chalk, chalking, chalks, city, daily, illusion, liverpool, london, newspaper3d, painting, pavement, philip, screever, sidewalk, star, street, uk, urban, urbancanvas. Bookmark the permalink. Follow any comments here with the RSS feed for this post.